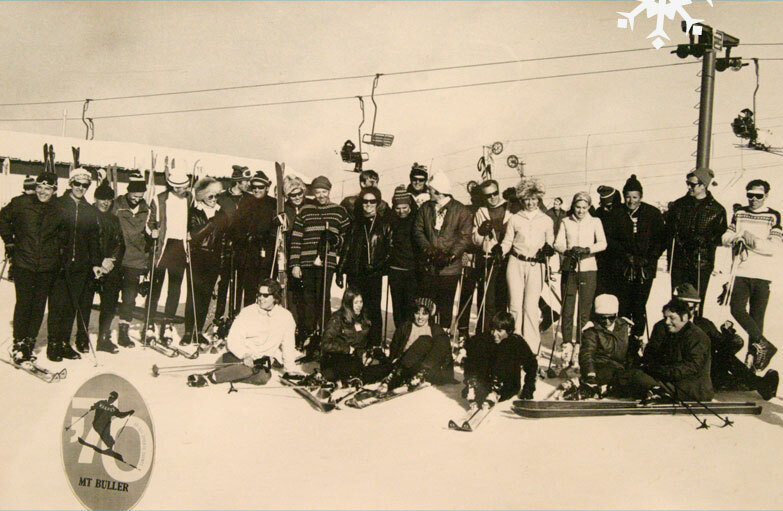 Neringa Ski Club was created by a group of Lithuanian emigres who missed the snow fields back home. These men from Melbourne had discovered the Victorian alps in the early 1960s and soon turned their attention to building a lodge. Mt Baw Baw was initially considered, but when land became available at the superior Mt Buller they jumped at the chance. A foundation meeting was held at Melbourne Lithuanian Club (then in Thornbury) at 2pm on 16 June, 1963. Taking part were: Petras Bimba, Jonas Gruzauskas, Jonas Masanauskas, Kestutis Miklius, Aga Tamasauskas, Jonas Tamosiunas, Vytas Vaseris, Jurgis Zalkauskas and their wives. The meeting named the club Neringa after the Lithuanian coastal village and based its constitution on the existing Latvian club on the mountain, Blue Eyes. It cost 50 pounds to join and annual membership was two pounds. The Victorian Forestry Commission allocated the club land at Lot 120, Stirling Track, and building work commenced at the end of December, 1963. A few days later, in the middle of summer, it started snowing! Neringa accepted its first guests by the opening of the 1964 ski season in June, despite there being only a rough exterior wall, a floor only at ground level, a roof and one door. Although Neringa's exterior has changed little, internal renovations have been significant. Long gone are the big dormitories, to be replaced by today's four-bunk rooms. The kitchen and bathrooms have also changed considerably, as has the ground floor area. Neringa takes pride in its reputation as a family club with a strong commitment to the mountain. Members have taken part in various Mt Buller ski races and festivals and the club regularly hosts the Australian Lithuanian Ski Carnival. Neringa has even played host to a Lithuanian Winter Olympic gold medallist. In Melbourne, meanwhile, the club has held numerous balls and other events to raise funds and introduce others to its activities. Neringa's pioneers have passed on their memberships to their children and several new faces have joined up. But the club maintains the spirit of its enthusiastic beginnings and continues to offer a warm and relaxed environment to a wide range of guests. Enjoy your stay in this little piece of Lithuania.